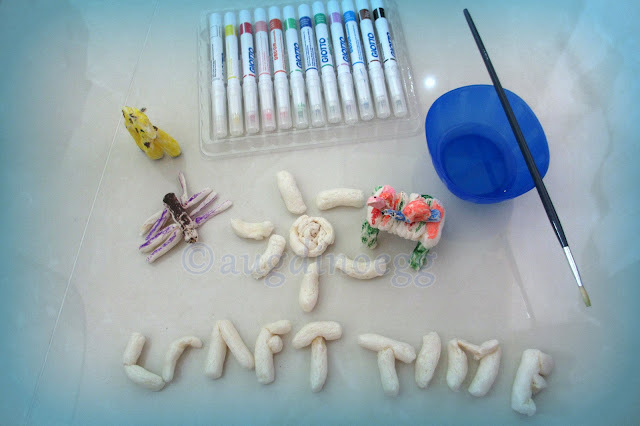 What do you do with starch-based packing peanuts? Well, add in Giotto Decor Pens, a pair of scissors, a paint brush and some water, you have some fun creating things with your little one. Why water? this is because the packing peanuts are made from starch therefore by brushing a little bit of water on them it will turn have a glue like surface thus able to stick them together. Thanks to Pamela of Tan Family Chronicles who has plenty of packing peanuts to share with a few of us. This is the 1st time we are doing craft with this. It is a very versatile material, u can flatten it, roll it, cut it, use a little bit of water to stick it together and transform it into something you like. Having nothing in mind what to make, I just threw him an idea "How about a spider?" which he spontaneously "Oh ya!!! Then we can hang it up in my wardrobe and scare away the monsters that are inside there." Though I was stunned for a second & considering how I should reply, I decided to go with his flow "That's right! We can use a string and tie it up, then hang in it to scare them away!" So he went ahead and do his spider. Even use the scissors (normal ones, not safety scissors) to cut 1 peanuts into 4 strips for the legs. Dipped the brush into the water n brush them on the spider head and legs then attach to the spider's body. While he was doing his spider, I play around too. 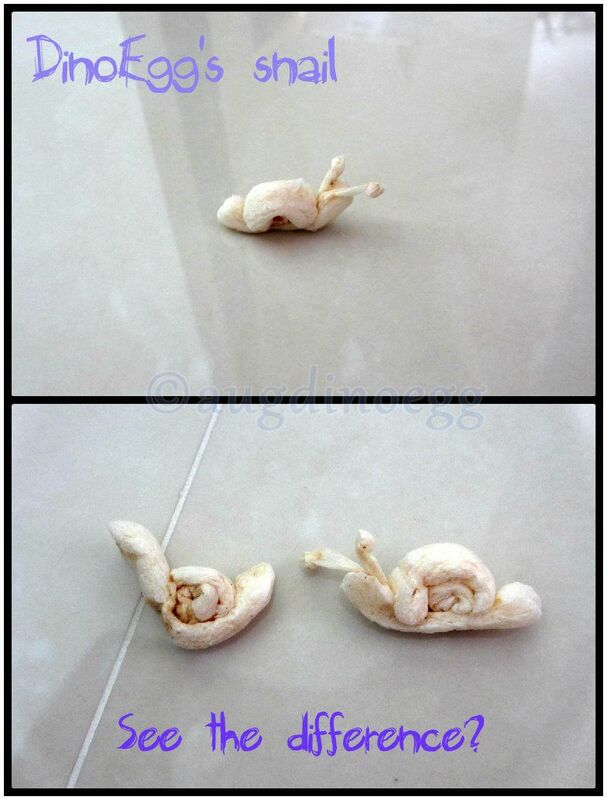 Decided to do a snail which is an epic failure hahaha~~ Little DinoEgg saw that I am doing a snail and he wanted to do one too. And he started it after he's done with the spider. After he's done, I am so proud of him and at the same time so ashamed of myself. Look at his snail!!!! Really look like a real snail, where else mine is like... a slug with a shell??? 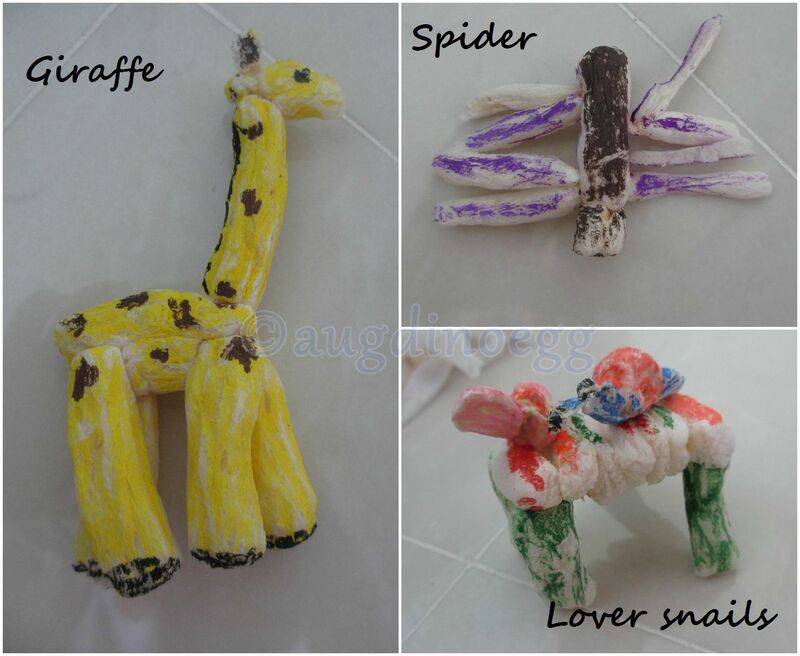 LOL However, I did well with my giraffe *proud*, it even have little horns n ears. We colored the animals & insects we made together. He insist that my snail is a Girl-Snail while he's is a Boy-Snail so that they can "get married." He rattle on... giving me a "lecture" on it "Ya, only boy & girl can get married, girl & girl or boy & boy cannot. Just like you and daddy. Daddy is boy and you, a girl so u get married then have me." *speechless* Here you are, Girl-Snail in PINK and Boy-Snail in Blue. He made a table for Lover Snails to sit together. Mummy shouldn't craft. Look at your slug! Haha!! Great job mommy Jenn! Aww come on. Z was being honest about me! :p and jenn, your slug CMI lah Hahahaha!!! But time well spent with Z!! Haha... So sweet! Lover snails! Looks like the packing peanuts are really versatile & fun! Should get some myself too! errrmmmm... your Z's snail really super "got" standard lor! LOL... love it love love love it! 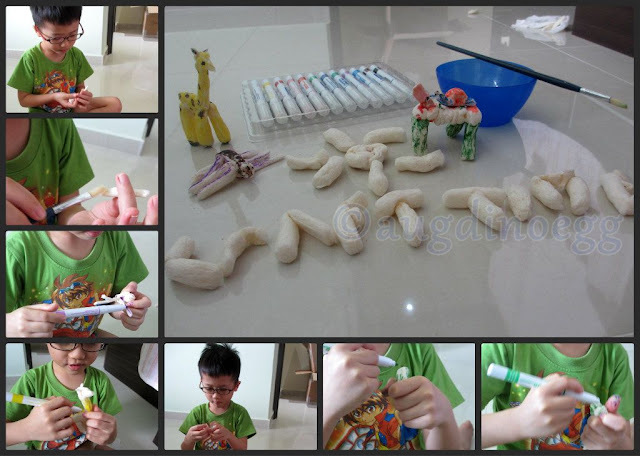 He cut out small tiny piece of the peanut, dab it with water, roll it n stick onto the snail. I'm so surprise he did that.